FINDLAY, Ohio, Jan. 31, 2019 /PRNewswire/ -- Crimson Midstream, LLC and MPLX LP (NYSE: MPLX) today announced an extension to the binding open season on the Swordfish Pipeline to align with the recently announced binding open season by Capline Pipeline Company LLC. Additionally, the Louisiana Offshore Oil Port (LOOP) recently confirmed the loading of three VLCCs in seven days from the deepwater port and stated the number of vessels loaded can be scaled to meet increasing market demand. To allow prospective shippers sufficient time to evaluate this new information and to solicit additional commitments for transportation service on the Swordfish Pipeline, the binding open season will now conclude at 12 p.m. EDT on April 30, 2019. 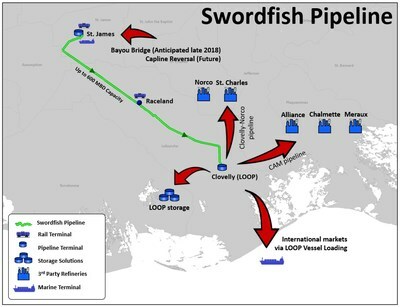 The Swordfish Pipeline is being jointly developed by Crimson and MPLX to provide connectivity from existing terminal facilities in St. James, Louisiana, and Raceland, Louisiana, to the Louisiana Offshore Oil Port (LOOP). The proposed pipeline would be a multi-diameter batched system with the ability to transport up to 600,000 barrels of crude oil per day and provide shippers with access to storage services, vessel loading, as well as connectivity to other carriers at the Clovelly Hub. The in-service date for the Swordfish Pipeline is anticipated to be in the first half of 2020. This press release contains forward-looking statements within the meaning of the federal securities laws. These forward-looking statements relate to, among other things, timing for the anticipated operations discussed above. You can identify forward-looking statements by words such as "anticipate," "believe," "design," "estimate," "expect," "forecast," "goal," "guidance," "imply," "intend," "objective," "opportunity," "outlook," "plan," "position," "pursue," "prospective," "predict," "project," "potential," "seek," "strategy," "target," "could," "may," "should," "would," "will" or other similar expressions that convey the uncertainty of future events or outcomes. Such forward-looking statements are not guarantees of future performance and are subject to risks, uncertainties and other factors, some of which are beyond the control of the companies and are difficult to predict. Factors that could impact the opportunities described above are: the timing and extent of changes in commodity prices and demand for crude oil, refined products, feedstocks or other hydrocarbon-based products; continued/further volatility in and/or degradation of market and industry conditions; changes to the expected construction costs and timing of projects; completion of pipeline capacity by competitors; the ability to obtain required regulatory approvals on a timely basis; or the occurrence of an operational hazard or unforeseen interruption. In addition, the forward-looking statements included herein could be affected by general domestic and international economic and political conditions.